Both methods are detailed below. Main Sponsor - GET YOUR ORGANISING COSTS COVERED! As you will see below, many clubs invite local businesses to become the Main Sponsor for the event. The Sponsor will get their Advert on the back page (the most prominant position), as well as their Logo on the Cover. Most clubs try and achieve the cost of the Deluxe Package (€895) and this way all other revenues from Horses, Adverts, and Sponsors are 100% Profit. 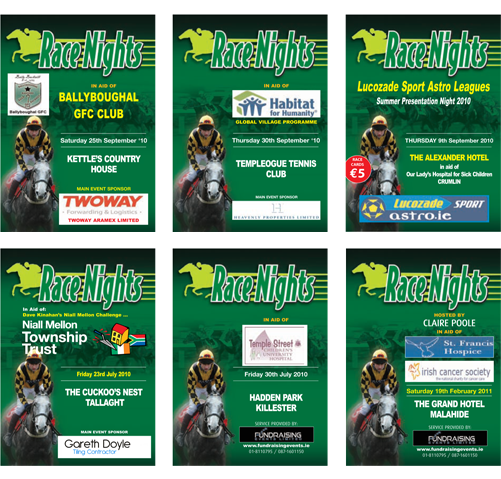 The Race Card is one of the most important parts of your Race Night as most of your revenue for the night is generated from it by pre selling Horses, Sponsors and Ads. The key is to get companies to place Advertisments and Sponsors in the Race Card and it is vitally important that this publication is as professional as possible for them. 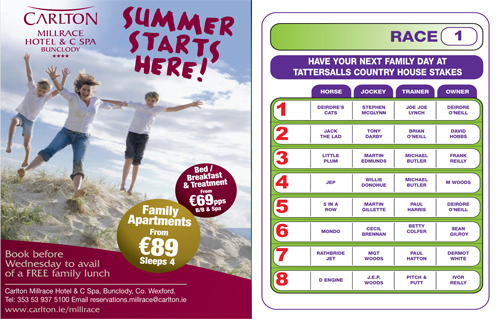 It is very attractive for a business to consider being the ‘Main Event Sponsor’ or ‘Advertisers and Sponsors’ if you can offer a high quality Full Colour Race Card. Fundraising Events provide each club with a Starter Pack which includes all the Blank Races and Adforms, which we then take back into our studio 4-5 days prior to the event and our professional Design Team lay everything out and Print a Full Colour Race Card.